Return boat & land transfer, English speaking guide, 3 nights Twin Sharing Bedroom, entrance fee, local bites, breakfast * 3, lunch * 3, dinner * 3. RDC is the gateway getting to know the uniqueness and importance of Borneo’s rainforests. Its main highlights are its exhibition halls, the Plant Discovery Garden, the Kapili-Sepilok Forest Reserve, environmental education programmes and a small lake for boat rides. Birdwatchers will be fascinated by this place as it has one of the rarest birds in Sabah, The Borneon Bristlehead and another 250 species of other birds. What’s the difference between Bilit and Sukau? Why we recommend you Bilit instead of Sukau? Bilit is the new Sukau, with its own collection of jungle lodges and homestays, is located at the up stream of Sukau. This is a totally new and great location to explore the local fauna and flora, tracking the wild animals in their natural habitat, established due to up stream migration of wildlife animals. 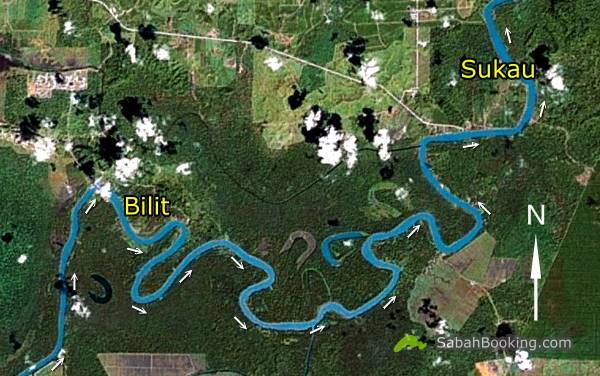 Both Bilit and Sukau is located along Kinabatangan River. Pick up from hotel and drive approximately 40 mins to Sepilok Orang Utan Rehabilitation Center. After registration, trek 10 mins through the rainforest on wooden boardwalk to the Feeding Platform. Witness the morning feeding of Orang Utans. Return to reception center, watchthe scheduled video programme (25 mins) at the Nature Education Center, andnvisit to the Exhibition Hall. Visit Sepilok for the second feeding in the afternoon. After that, pay a visit to Rainforest Discovery Centre. The Exhibition Centre and the Plant Discovery Centre will bring you a lot of information about the nature in the area. Walk on a suspension bridge and ending it with the only Canopy Walk in Sandakan. Dinner & stay overnight at SJR (Twin Sharing Basis). Pick up at Resort and drive overland (2 hrs) to reach Gomantong Cave. Continue overland to Bilit, Kinabatangan River. Upon arrival,a warm welcome by the staff followed by an afternoon tea with some local bites. Leech socks and gumboot are available for rent at RM10. Simple picnic lunch at the jungle. After lunch, trek back to the lodge to freshen up and transfer to Sepilok Jungle Resort. You may meet leeches in the jungle, please wear on leech socks. Please tell us the departure time of your flight.